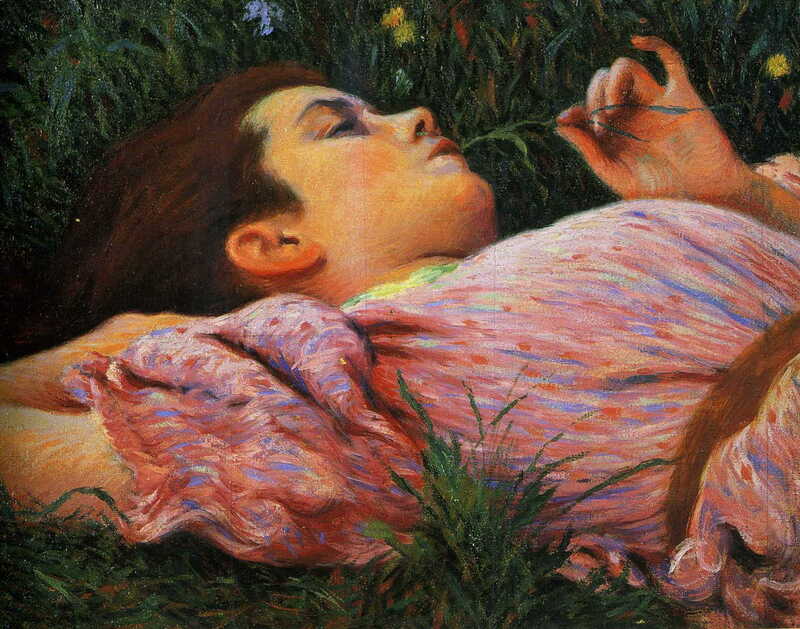 Federico Zandomeneghi, Lady in a Meadow (1893), oil on canvas, 46 x 38 cm, Private collection. WikiArt. Born in Venice to a family of sculptors in 1841, he entered the Academy of Fine Arts there in 1856. In 1859 he left Venice, and the following year joined Garibaldi’s forces. As a result he was wanted by the Austrian police as a deserter, so he was unable to return to Venice. When he tried to return in 1862, he was arrested and imprisoned there until his release could be agreed. He then fled to Florence, where he met with the Macchiaioli in the Caffè Michelangiolo. He became particularly friendly with Cabianca and Martelli, and spent time on the latter’s estate near Castiglioncello, as well as visiting Rome. His paintings during this period conformed to Macchiaioli style, and most that survive are relatively large finished studio works. In 1866 he was able to return to Venice (then free from Austrian forces), but moved to Paris in 1874 where he met with Impressionists at their first exhibition. He was particularly attracted to the work and company of Pissarro, Sisley, and Degas, who he met in company with Martelli. Once working alongside the Impressionists, his style quickly changed to parallel theirs, with high chroma, depictions of the effects of light, and the like. He painted a range of motifs, including several views of Paris, and various social and indoor genre scenes. 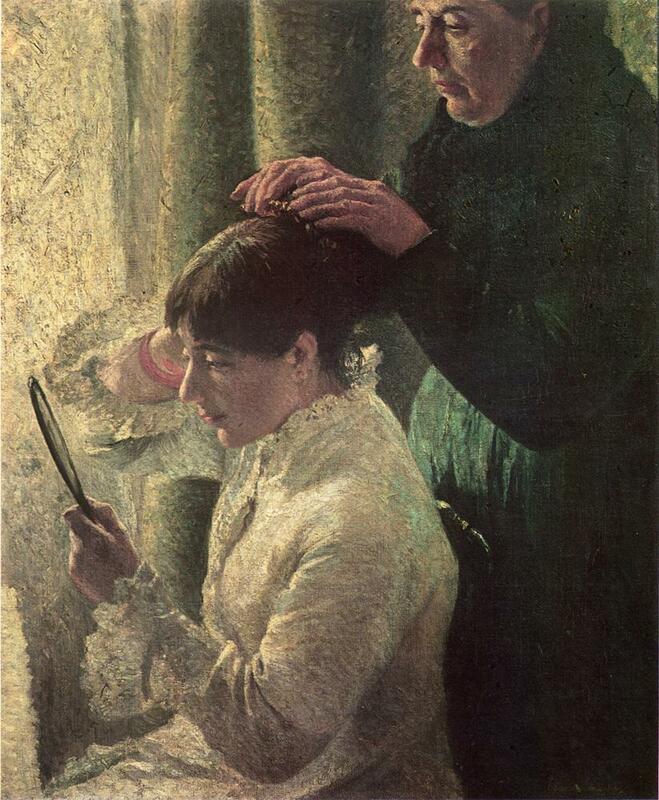 Federico Zandomeneghi, A Mother and Daughter (1879), oil on canvas, 61 x 50.8 cm, Private collection. WikiArt. 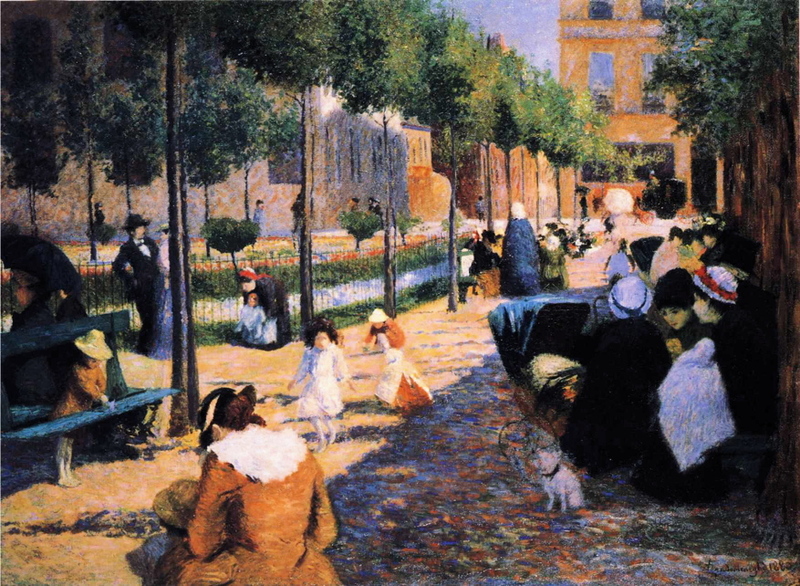 Federico Zandomeneghi, Place d’Anvers, Paris (1880), oil on canvas, 100 x 134.9 cm, Galleria Ricci-Oddi, Piacenza. WikiArt. After four years in Paris, he moved into Montmartre, and met the dealer Durand-Ruel. He took part in the Impressionist Exhibitions of 1879 (the fourth) and 1880 (fifth), and the critic Huysmans became a keen supporter of his work. 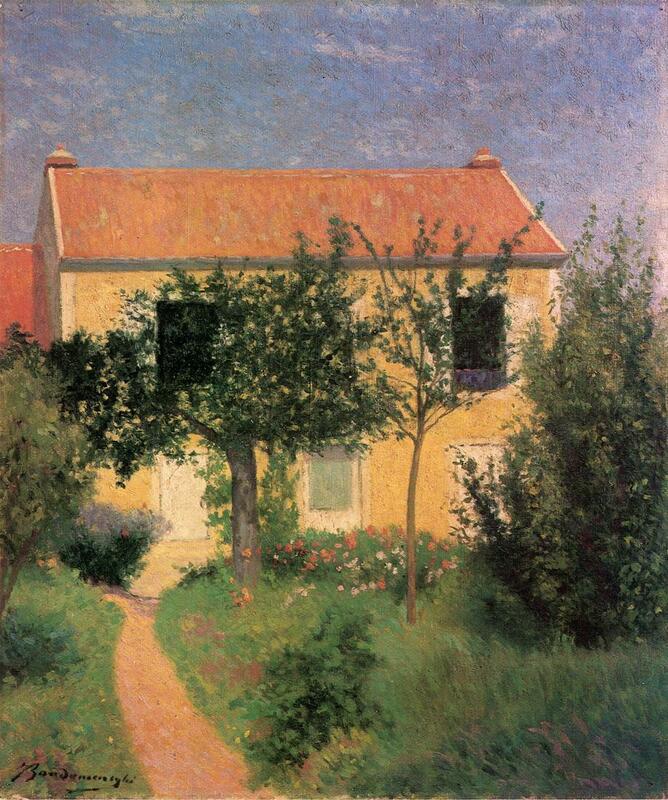 Federico Zandomeneghi, The Red Roof (date unknown), oil on canvas, 53.3 x 45.7 cm, Private collection. WikiArt. Federico Zandomeneghi, After the Bath (date unknown), oil on canvas, further details unknown. WikiArt. Federico Zandomeneghi, A Girl Picking Flowers (date unknown), oil on canvas, further details unknown. WikiArt. 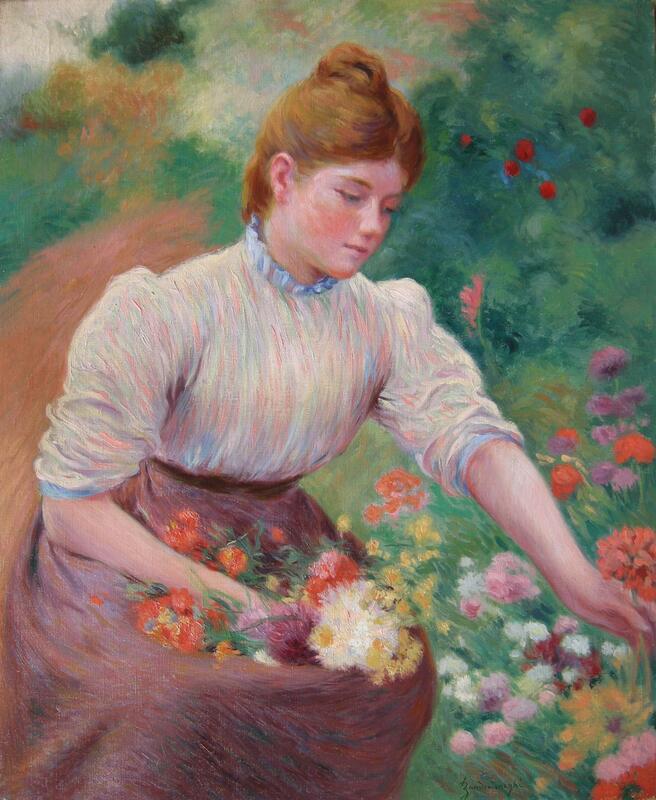 Federico Zandomeneghi, A Girl with Flowers (1884-94), oil on canvas, further details unknown. WikiArt. Although he maintained contact with the Macchiaioli in Italy, he remained working in Paris. 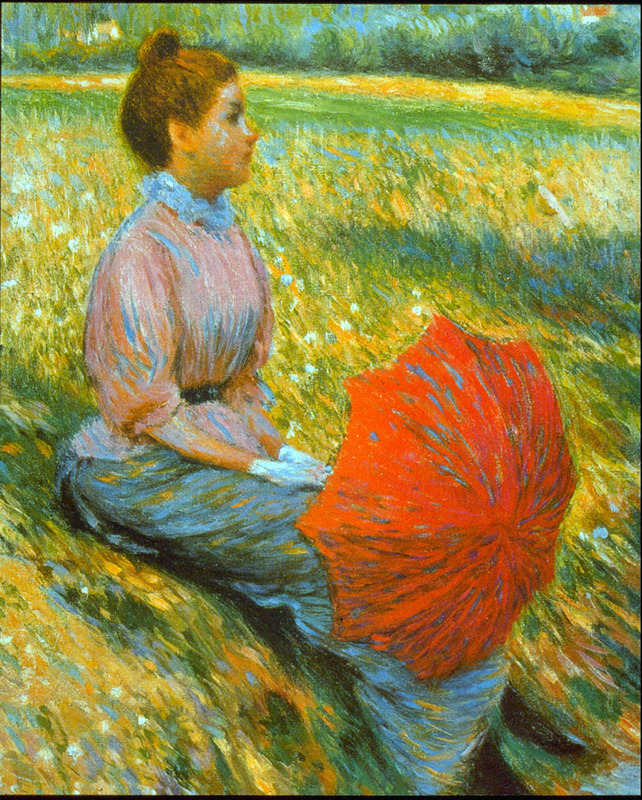 In 1888, with Seurat and Signac developing Divisionism as a movement, he studied their ideas very carefully but decided not to change his style. 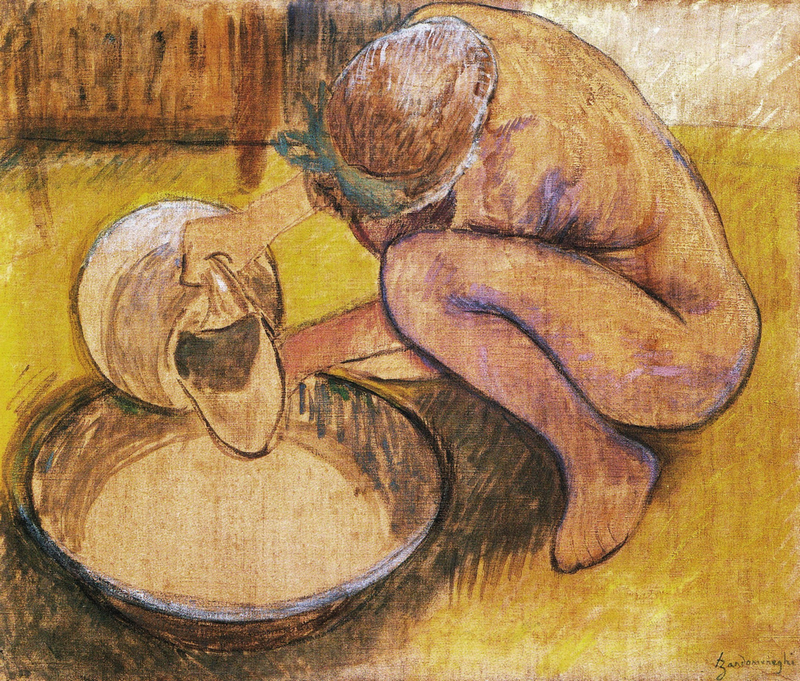 Federico Zandomeneghi, The Washtub (date unknown), oil on canvas, 55 x 65 cm, Private collection. WikiArt. 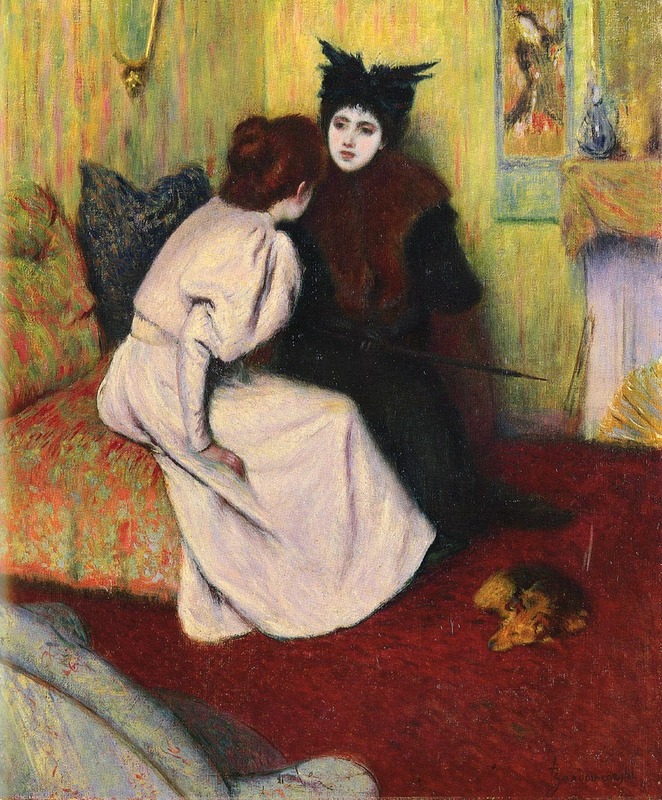 Federico Zandomeneghi, The Conversation (1895), oil on canvas, 55 x 46 cm, Private collection. WikiArt. In 1898 he had a solo exhibition at the Durand-Ruel Gallery in Paris, then in 1906 two of his paintings were shown in the International Exposition in Milan. He was also honoured with a retrospective exhibition at the Venice Biennale of 1914. He continued painting in ‘high’ Impressionist style until his death in Paris in 1917, just three months after his great friend, Degas, had died. Although celebrated during his day, in the early twentieth century he was relegated to the ‘outer’ group of Impressionists, and his work has almost been forgotten as a result. 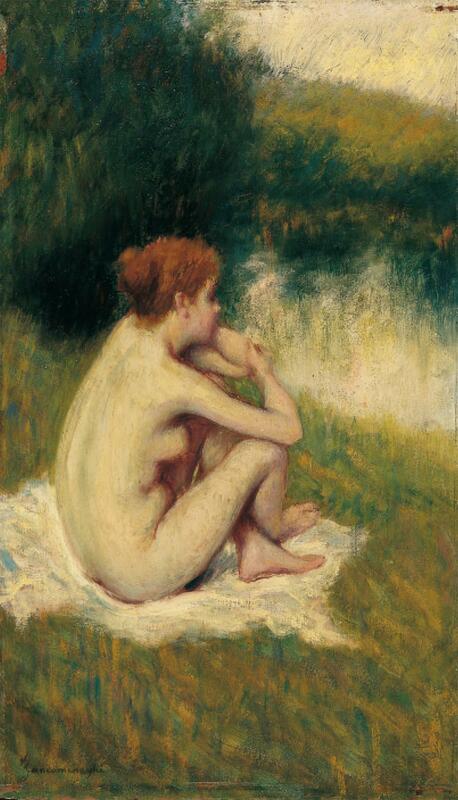 However his richly colourful paintings of women are reminiscent of Renoir at his best, and some of his later studies of nudes appear to owe much to the influence of Degas. Another victim of the re-writing of the history of Impressionism during the twentieth century, it is time that his work was better documented and its importance more widely recognised. This is also not helped by the fact that many of his best paintings are now in private collections, and he does not have a museum in Italy to act as a focal point for his work or records. Perhaps the simplest way to appreciate the Macchiaioli is as an overseas Barbizon School, but unlike Corot and others in the Barbizon School itself, the Macchiaioli as a group did not directly influence the development or course of Impressionism in France, or of painting in Western Europe more generally. However two former members of the group, Boldini and Zandomeneghi, went on to develop distinctive mature styles which were of greater influence, the former in fin de siècle portraiture, the latter as an Impressionist. Whilst their early Macchiaioli work was undoubtedly important in their individual development, it was only when they had moved on in the mid 1870s that they established their places in the history of painting. The next articles in this series move on to examine important Belgian painters of the day, and will cover Guillaume Vogels, Émile Claus, and Théo van Rysselberghe. Posted in Painting and tagged Boldini, Degas, Impressionism, Italy, Macchiaioli, painting, Pissarro, Sisley, Zandomeneghi. Bookmark the permalink.